Darksiders is a combat-focused action adventure game in which you use your gigantic sword, special powers and arsenal of super-charged weaponry to hack 'n slash your way through dozens of creatures that have been sent from the depths of hell. In this story of betrayal and revenge you take on the role of "War", one of the four horsemen of the apocalypse, as he seeks to hunt down the entity responsible for Armageddon. The Charred Council actually blames War for the premature ending of the World and sentences him to death. War pleads to be sent back to Earth in order to find the demonic being that was really behind the disaster. Under the condition that The Watcher keeps a close eye on him, War is sent back to Earth, where angels and demons fill the streets and skies, on a mission to restore balance to heaven and hell and seek out the Destroyer. Phantom guards, wraiths, minions, broodlings and all kinds of horrific creatures await your sword. Though the hack ‘n slash gameplay does remind us of the Devil May Cry series, as you rack up and unlock combos, execute finishing moves and use your array of special powers to tackle the comprehensive bestiary, there's a lot more to Darksiders than just button-mashing and it's clear that some influence has been garnered from the likes of God of War and Legend of Zelda. The game’s currency is souls, which you collect from treasure chests and the bodies of the slain. As well as improving your health and unlocking special powers, souls can be used to buy upgrades to improve your chances in battle and to build up your wrath metre, which allows you to unleash your special powers. Exploration, puzzle-solving and platforming also play a part as you ledge-hop, wall climb and drag and pick up objects to give you a helping hand. You'll also often have to use an item in your inventory, such as the Abyssal Chain, to reach a certain areas, or defeat a particular monster, for example, by using the powerful sound of your horn to knock over an enemy, before approaching him and burying your sword into his body. There's also plenty of freedom to explore away from the dungeon-crawling gameplay as you search for collectibles, in the form of chests and legion artefacts. And you'll get the chance to fly, ride a phantom steed and take on some hellish big boss battles and mini-games, such as speed brawls in order to earn extra rewards. 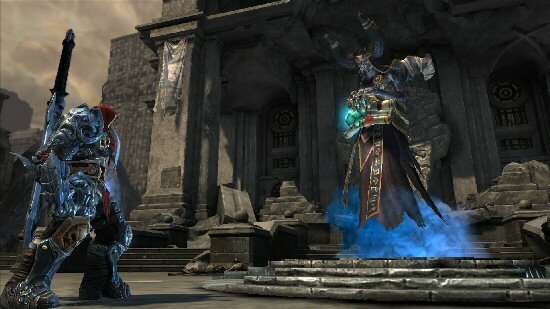 Alongside Sega's Bayonetta, Darksiders is one of the first big releases on 2010. But will we remember it come year end?